End of year accounts. To view Winston Parish Council's 2018/19 year end accounts plus a copy of the bank reconciliation and explanation of significant variances between the accounts for the relevant year and previous year please download here. To view year end accounts for previous financial years download here. Annual governance statement. To view Winston Parish Council's annual governance statement for 2018/19 please download here. To view previous financial years download here. Internal audit report. To view Winston Parish Council's internal audit report for 2018/19 please download here. To view previous financial years download here. List of Councillors and their responsibilities. 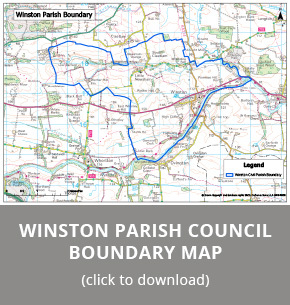 To view the details of Winston Parish Councillors please see the Councillors page of this site. Due to the size of the Council there are no Committees instead all decisions are made by the Full Council. Several Councillors do represent the Council on external local public bodies and these roles are also detailed on the Councillors page of this site. Details of public land and building assets. Winston Parish Council's fixed assets comprise of the bus shelter located on the north side of the A67 on the east side of the junction with the B6274 (valued at £2395.00) and the defibrillator and steel cabinet located outside Winston Parish Hall (valued at £1995.00) both of which together value £4390.00. Minutes, agendas and papers of formal meetings. These can all be viewed on the Agendas and Minutes page of this site. The agendas and any associated meeting papers will be produced and displayed on the Agendas and Minutes page of this site not later than 3 clear days before the meeting to which they relate is taking place. In addition, agendas are also displayed on the village noticeboards in Winston. INSURANCE POLICY - To view Winston Parish Council's current insurance policy please download here. ACTION PLAN 2019/20 – To view the Council's Action Plan for 2019/20 please download here.